Love the kings. Hate the crowds. That’s my problem with Versailles and here’s the solution: the Palace of Fontainebleau. Located 35 miles outside of Paris and home to kings and queens of France since the 12th century, Fontainebleau shares several characteristics with Versailles. It is filled with history, enlivened by splendid art and architecture and is surrounded by immense forests, parks and formal gardens. What Fontainebleau does not share with Versailles is the overwhelming crush of visitors. We were there on a Thursday during the Easter holidays with no lines and no tour groups. Without the modern day mob scene, it was easy to imagine the daily lives of a homesick Catherine de Medici, a renaissance-besotted Francis the First, an imprisoned Pope Pius VII and an emotional Napoleon en route to Elba. Aided by an absorbing English language audio guide, even our 11 year old daughter happily spent 1 ½ hours wandering through this monument to French art, architecture and history. 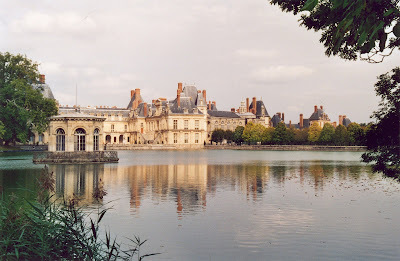 If you are looking for a great day out of Paris, Fontainebleau is hard to beat. If there is a downside to Fontainebleau, it would have to be the fact that it is not the easiest place to reach. We arrived by car which was an easy 45 minute journey on the A6 motorway out of Paris but a torturous 1 ½ hour journey back in the early evening. Travelling by car allowed us to take a quick side trip to the artists’ village of Barbizon, drive through the INSEAD business school campus, and consume a grand lunch in the forest near the town of Larchant followed by a walk and some rock climbing. If you don’t mind navigating and driving in and around Paris, renting a car for the day would open up your options in this wonderful part of France. Take a train from Paris – Gare de Lyon to Fontainebleau-Avon station. Here is a link to a journey planner with schedules and fares in English. The trip should take about 50 minutes. From the Fontainebleau-Avon station, take Bus #A or Bus #B to the Palace. The trip should take about 15 minutes. Taxis from the station are also available. SNCF sells a combination train/bus/palace ticket (including guide book) at the Gare de Lyon which cost €26 as of July 2008. The palace is open every day except Tuesday. Fontainebleau is a perfectly manageable sight. The chateau is revealed to have evolved over a number of centuries. Don't miss the inside tour with most of the original furnishings and decor. Several uncrowded brasseries nearby. Parking is a snap if you drive. I saw Versailles last July. There are ways to avoid the crowds to some extent if you can plan ahead. I'd visit the palace itself in the winter, and the gardens first thing in the morning. Not everyone has that luxury of two season visiting, I know. I go to Fontainebleau tomorrow for a Monday morning visit, and I can't find out if photography is allowed inside. I hope you enjoy your visit. I seem to remember that photos were allowed inside but no flash. It would be great if you could let us know for sure after your visit.